If you have been growing succulents in pots outside, you can transition them indoors to a sunny spot. Most are dormant during cold months and they need a bit of down time in a bright, cooler environment to produce better blooms in the spring and summer. Just as in real estate, location if very important for growing succulents indoors. They prefer about six hours of sunlight a day. Choose a bright windowsill and set them close to the window. You will, though, need to be cautious about southern facing exposures. Plants can actually get a sunburn from the light being magnified through the glass. If you have an eastern facing window that would be ideal. For southern or western light, just set the plants back a bit from the window. Succulents that don’t get enough light tend to become a bit “leggy” – they grow long with minimum foliage. If that happens, don’t fret. You can actually snip off the leggy stems, stick in in a new pot and grow a whole new plant. Just give this one a gradual return to a hot, sunny location. Once it roots itself, it’s ready for a brighter spot. I’m sure you’ve heard that succulents don’t need water. That’s a fatal exaggeration. Yes, overwatering is the #1 way that folks kill succulents, but that doesn’t mean you should ignore their needs. If you can’t tell by looking at the soil if it’s dry, stick your finger in about an inch down to test for moisture. Because succulents go dormant in cooler weather they don’t need as much water when growing indoors. As a very general rule, water about every two to three weeks. Do not use a spray bottle to mist your succulents. While this may work well for humidity loving plants, succulents thrive in an arid environment. Many people think their plants are dying when they see some of the foliage shriveling up. If this is happening to the lower leaves, don’t worry, this is normal. You need only be concerned if the newer leaves are not flourishing. If you want to be successful growing succulents indoors it is important to pick the right pot. A terrarium would not be a good choice. Those boggy conditions would increase the chance of disease and pests. Your best option is a porous pot with a good drainage system. Air flow is very important, especially in the winter. The soil needs to dry out quickly and the plant needs to breath. If your pot has a dish at the bottom to hold water overflow, be sure you empty it out so the plant is not sitting in water. 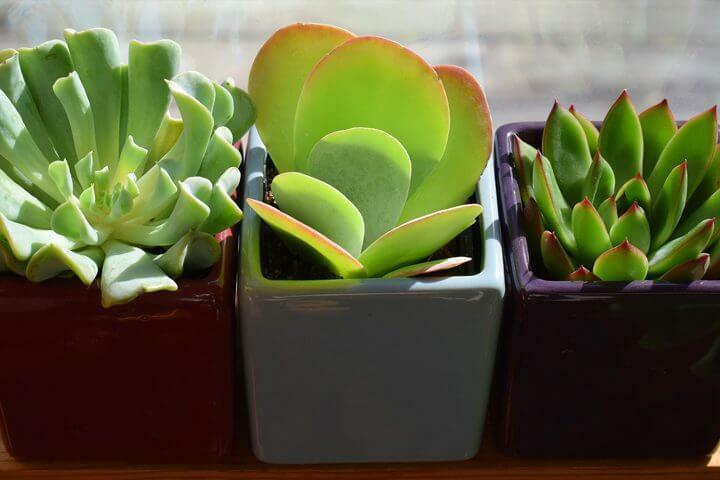 Terra cotta pots work very well for growing succulents indoors. Glazed ceramic pots are also good if they have appropriate drainage holes. A trip to your garden center should give you lots of lovely options to choose from. The soil you choose is also important. A good potting mix with additives to improve drainage will work. Stay away from top soil because it’s too dense. When growing succulents indoors all year around, the plants won’t notice a drastic change in temperature. As a rule of thumb, they like a warm summer and a bit cooler temps in the winter. Normal house temperature should work just fine. Keep in mind that the sun shifts its axis path during the seasons, so you might need to move plants to a different location depending on the light in your home. Most succulents won’t survive a freeze. There a few hardy species that can tolerate some cold temps but those cute little succulents that are bred for windowsills and porches won’t like a drastic shift to cold. If you follow these suggestions you should be very successful at growing succulents indoors. And nothing brightens up a windowsill better that a sweet plant in a pretty pot.